Application of the SEEDS model to the United Kingdom shows that an escalating real cost of energy poses a major threat to the economy. What are we going to do about it? And do we even know what we are facing? What with the European elections and other interesting events, it’s been a while since I wrote about my core thesis, surplus energy economics. For anyone not familiar with this – and allow me to recommend my book Life After Growth! – SEE is a discipline which argues that the entire economy is, and always has been, an energy equation and not, as so many people assume, a monetary construct. Society and the economy began when farming gave us the first energy surplus, enabling a small minority of the population to turn to non-subsistence tasks, and the discovery of the heat engine applied dramatic leverage to that surplus, creating the complex societies that we take for granted today. Of course, energy isn’t ‘free’. In accessing energy, some energy is consumed, be it in drilling oil wells, sinking mine shafts, constructing pipelines and refineries, or fabricating solar panels, wind turbines or nuclear reactors. Where prosperity is concerned, what matters is the difference between the gross amount of energy accessed and the energy consumed in doing so. Obviously, if we used up 100 units of energy to access 100 units, the exercise would be pointless, because there would be no energy left over for us to use. This cost ratio is measured as EROEI, or the ‘Energy Return On Energy Invested’. If 50 units of energy are accessed and 1 unit is consumed in the process, the EROEI is 49:1. Put another way, the cost of accessing the energy is 1 divided by 49, or 2%, a number which I call the ‘Energy Cost of Energy’, or ECOE. As we go about our economic activities, the system imposes this ECOE cost on us. With our specimen EROEI of 49:1, we’d hardly notice a 2% levy on our activities, not least because the ways in which we measure economic output (such as GDP, or Gross Domestic Product) are far from perfect. Thus a modest energy ‘levy’ isn’t generally noticeable, especially if it is pretty static over time. Increase that levy from, say, 3.6% to 5.6%, however, and we begin to notice its effects. For those who persist in regarding the economy as nothing more than a monetary system, the noteworthy features would be an undershoot against growth expectations combined with a big real-terms increase in the cost of the energy that we use. Those who are familiar with SEE, on the other hand, regard such trends as indicative of a rising ECOE, or in other words a falling EROEI. Looking around the energy scene, they would observe that huge, cost-effective sources of energy are in decline, and that the industry is turning its attention to resources which are far costlier to access. Despite the sterling efforts of the EROEI community, we do not have an overall calibration of global, national or by-fuel EROEIs and ECOEs. I must stress that my SEEDS (surplus energy economics data system) model cannot possibly be definitive, and neither is it intended to be. Its purpose is to provide, in the absence of anything better, a general outline of where I think ECOE has been, and where it is going. The application of SEEDS to the United Kingdom shows a worrying deterioration in EROEIs and, consequently, a sharp uptrend in the ECOE (energy cost of energy) as it affects economic performance. Eleven years ago, in 2003, Britain was continuing to benefit from its North Sea windfall. Our production of energy, at 237 million tonnes of oil equivalent (mmtoe) remained greater than consumption (226 mmtoe), though the surplus had narrowed to 11 mmtoe in 2003 from 50 mmtoe in 1998. Since then, oil and gas production have both dropped by about 65%, whilst coal output has halved from an already low level. Despite progress with renewables, overall UK energy production has declined from 237 mmtoe in 2003 to about 102 mmtoe today, and seems certain to go on falling. This has happened at the same time as global ECOEs have been rising sharply. SEEDS shows this global average rising from 3.6% in 1998 to 5.6% in 2008, thus playing a major (though often overlooked) role in the 2008 economic slump. Since then, my estimate of global ECOE has climbed further, to 7%, which helps to explain why oil prices remain well ahead of 2007 levels despite a sharp intervening slump in economic activity. For Britain, this trend has been far worse, because we have swung from a net exporter to a net importer of oil and gas. Even where EROEIs are the same, by the way, a net exporter gains versus a net importer of energy because costs (and taxes) stay at home. Reflecting this, my estimate of Britain’s overall ECOE has soared from 2.8% in 1998 (when the global average was 3.6%) to 13% today, getting on for twice the global average. Both factors – rising global ECOEs, and a deteriorating energy trade position – are set to continue. It would be futile, though instructive, for us to lament British energy decisions of the past. Our net export revenues, which we might have saved (like Norway) or invested in the modernisation of our industrial base, were spent instead on tax cuts and the cost of unemployment. Exporting part of our always-modest gas resource, and using more of it to switch to gas-fired electricity production in pursuit of a quick buck, surely needs no comment from me. What matters now is coping with the future outlook. Basically, high and rising ECOEs are going to undermine our economic performance. What we need to do is to be aware of this, to minimise it where we can, and to manage the broader consequences. (And, by the way, don’t pin your hopes on a shale bonanza which isn’t going to happen here, and is likely to be over within three or four years in the US). The chart below is designed to give you an outline of where this might lead. 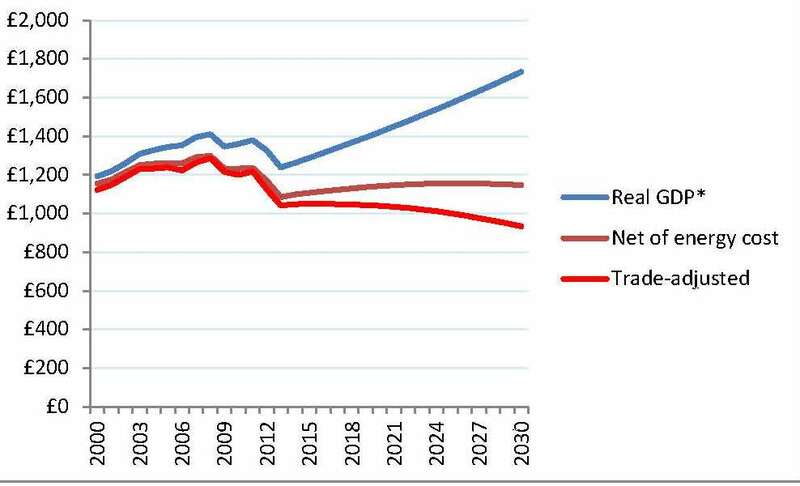 The blue line shows real GDP growing at an assumed annual rate of 2% into the future. Of course, our horrendous current account deficit, and our equally horrendous levels of debt, might make this assumption untenable, but let’s stick with it for now as a base-line. The dark red line adjusts this for ECOE, showing real GDP less the cost of energy. This cost has always been there, of course, but the combination of global trends and our worsening energy trade position are transforming this cost from a barely-noticed irritant to a very serious drag. The bright red line shows a further adjustment for our current account balance, already very bad but capable of becoming much worse if our net trade in energy (which includes both direct energy and energy-incorporating products such as food) deteriorates as our energy production continues to erode. Of course, how we counter this is a matter for government. Going ahead with nuclear, after Labour’s long hiatus, is clearly necessary, even if our choice of new reactors seems a strange one. We also need to press ahead with renewables, ultimately making a choice between economic costs on the one hand and NIMBYism on the other. However you look at it, this is a major challenge. At the very least, ensuring energy continuity is going to be hugely expensive, impairing what we have left to spend on other things. #24. What should we make of UKIP? When UKIP (the UK Independence Party) secured 27.5% of the vote in the European elections, it was the first time in more than a century that any party, other than Labour and the Conservatives, had won a nationwide election in Britain. Quite intentionally, I’ve taken a week to respond to the European election results, because what we need is a deeper analysis instead of the kind of knee-jerk response that has characterised much of the mainstream media’s reaction. Some of the parties that triumphed in these elections might indeed be “right wing”, “left wing” or less than mature and professional in their conduct of politics, but this is to miss the point, which is that the European electorate has delivered a damning verdict on the established parties and, by extension, an equally damning verdict on our economic and social systems. Very simply, this is the revolt of the disaffected. Whilst the EU and immigration have been flagship issues, the substance of the electoral “earthquake” has been a backlash against a globalised, corporate-dominated economic system that seems to favour an affluent, politically-connected elite at the expense of everyone else. Many in the mainstream political and media world have sought to belittle the surge in support for UKIP. Some say that the party is irrelevant, because our first-past-the-post (FPTP) electoral system makes it all but impossible for UKIP to secure a significant presence in the House of Commons. Others have argued that UKIP is a single-issue protest group rather than a political party as such, and still others have derided UKIP as (in the words of Tony Blair) “nasty and unpleasant”. To dismiss the surge in support for UKIP in this way, and to assume that its voters’ only (or even primary) concern is the European Union (EU), is to make a grave mistake. UKIP represents a political position which, even if it is less than fully coherent, commands widespread support. Moreover, even a British exit (“Brexit”) from the EU would not assuage the anger that motivates UKIP voters. To understand why, we need to see UKIP in a pan-European context. The result in France, where the Front National (FN) topped the poll with 25% of the vote, is arguably the single most important outcome in the 2014 European Elections. The surge in support for the FN imperils the European Union (EU), because Germany cannot carry the European project alone. If Britain were to leave, the EU would probably survive, but a French pull-out would kill the EU stone dead. Critics who deride the FN as “extremist” and “racist” are missing the point. Though opposition to immigration is part of the FN’s platform, its appeal is far broader. Essentially, the FN has become the preferred vehicle for the disaffected, people who probably account for two-thirds of the French electorate. The analysis here is that globalisation has benefited two groups – immigrants, and a wealthy cosmopolitan elite – at the expense of everyone else. Those who have read Life After Growth will know that I’m highly critical of globalisation. In pursuit of micro-economic (corporate) gain, the West has undermined its macroeconomic position by outsourcing production to cheaper markets whilst expecting to go on consuming at ever increasing levels. Activities such as manufacturing, farming and mining – which, collectively, I categorise as “globally marketable output” – have been replaced by services which we provide to each other, either directly or via the state. Inevitably, globalisation has been accompanied by an escalation in state and private debt as we endeavour to maintain our consumption even though our marketable production has declined. We seem to have forgotten that you cannot indefinitely consume if you do not produce, and services that we can only sell to each other hardly cut it in a global economy. Western economies have been deskilled, and globalisation has eroded real wages for a substantial majority of the workforce. This disaffection with a globalised, pro-corporate and pro-rich economic system is exacerbated by a lack of faith in institutions. Many French people view the mainstream political establishment with contempt, which is hardly surprising given the extremely low quality of the French national leadership in recent years. The bedrock disaffection which has driven the FN vote upwards has its parallels in the rise of support for UKIP in Britain. Though different in character, the division between “us” and “them” is every bit as serious here as it is in France. Those who take a long-term view of national evolution have every cause for concern where British institutional life is concerned. Politicians’ standing has been undercut by the expenses scandal, phone-hacking revelations have discredited not just the media but the police as well, and the banking system has fallen into public discredit since the financial crisis, an impression exacerbated by a series of scandals. Of course, most politicians do not fiddle expenses, most journalists do not tap phones, most policemen do not take bribes, and most bankers do not enrich themselves at the expense of customers and society, but it tends to be on the headline impression, rather than on the broader and more mundane substance, that the public reaches its verdict. There is a widespread belief, too, that the political, administrative and business elite do not inhabit the same world of accountability as the rest of us. Expense-fiddling politicians seem to get off lightly compared to benefits cheats, few if any heads rolled over the Stafford NHS disaster, wealthy foreigners are allowed to live in Britain virtually tax-free, we still do not have the full story on Iraq, and the widespread assumption of symbiosis between government and finance has been worsened by the (disastrous) decision to rescue the bankers at the same time as rescuing the banks. Of course, this anger might have been less acute if the economy was doing better, and the steady decline in real incomes – especially in relation to the escalation in the cost of essentials – has made matters much worse. Widespread hardship, and continuing ultra-high levels of household debt, undoubtedly make the affluence of the elite harder to stomach. Most Europeans, of course, have further grounds for complaint, in that the single currency has been a disaster for almost every Eurozone country other than Germany. Even a first-year student of economics could have told the EU that you cannot combine a single currency with a multiplicity of budget processes, because monetary and fiscal policy need to be complementary. Denied the normal devaluation route, countries such as Spain, Portugal, Ireland and Greece have had to deal with competitive weaknesses through an extremely painful process of internal devaluation, with predictably nasty (and largely avoidable) consequences for living standards. The political establishment, whether in Britain or in Europe more broadly, will not understand the electoral upheaval until it stops bandying pejorative terms (such as “right wing”, “single issue” and “protest vote”) and starts to understand that what we are witnessing is the start of a revolt by the disaffected. What these disaffected voters, in their tens of millions, are telling us is that an economic system based on globalisation, deregulation, corporate self-interest and elitism has failed. My point, from an economic perspective, is that globalisation has become a debt-creating machine, the European single currency has been a disaster, and the widening gap between the rich and everyone else is economically as well as socially damaging.